Humans are pretty good at mucking up the Earth, whether we’re warming the climate, leveling the rainforest, or driving wild animals extinct. But climate change, at least, was wreaking havoc long before we got involved. For instance, it’s looking very likely that global warming, rather than human spears, doomed Earth’s wooly mammoths. There’s a popular belief that Pleistocene hunters drove many of Earth’s megafauna to extinction some 11,000 years ago. But with recent improvements in the paleoclimate record, an alternate theory has taken the stage: Rapid climate change, not humans, could have killed off Earth’s biggest, baddest animals. A study published this week in Science offers a bit more nuance. Using paleoclimate records and ancient DNA analysis, a team of researchers has found that short, rapid warming events throughout the Pleistocene (60-12,000 years ago) coincided with major mammoth die-offs. 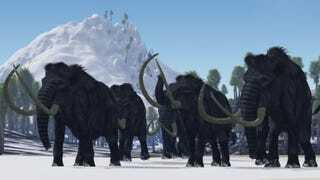 While human hunters might have delivered the final blows toward the end of the Pleistocene, wooly mammoths were already on thin ice, so to speak, thanks to climate change. Until recently, paleontologists relied on the fossil and geologic records to study the rise and fall of big mammals over the past 60,000 years. But recently, our ability to extract and sequence ancient DNA has improved dramatically, offering scientists a powerful tool for investigating extinction. Based on how diverse an individual’s DNA is, scientists can estimate how plentiful its population was at the time. In the new study, a team led by Alan Cooper of the Australian Centre for Ancient DNA extracted and sequenced mammoth DNA from thousands of radiocarbon-dated bones across North America and Eurasia. The researchers also dug into paleoclimate data to track temperature swings over the same 50,000 year period. While during cold swings, mammoths did just fine, populations underwent rapid bottlenecks when the temperature ticked up. From this discovery, the researchers concluded that hot spells were probably the root cause of most mammoth die-offs throughout Pleistocene. Sure, you can say this is simply more evidence that abrupt climate change and extinction are natural phenomena—and for most of Earth’s history, they absolutely were! But right now, humans are the ones shifting the winds, and is history is any guide, that might not end so well for us.